1) The DCR has a memory extended to 24 hours following the first dive, thus it gives exact results in case of repeated dives. 2) The DCR can be used to the maximum depth allowed by the air cylinder (60 mt - 200 ft). 3) The DCR assures safe dives up to maximum range of two (2) consecutive bycylinders (8000 lt. of air). 4) The DCR, though being more "safe" allows considerable saving on decompression time avoiding useless excess. 5) The DCR allows with major accuracy stops at deeper depths (up to 21 mt - 70 ft). 6) The DCR takes into account work carried out by the diver. 7) The DCR takes into account if dives take place in either normal temperature or particularly cold water. 8) The DCR can be regulated according to any type of decompression table by changing the guide numbers table. The DCR dives indications for all dives requiring a first stop within maximum of 21 mt (70 ft) and that is even in case of very deep dives. In any case when the indicator reaches 21 mt (70 ft) the ascent should be commenced at once. 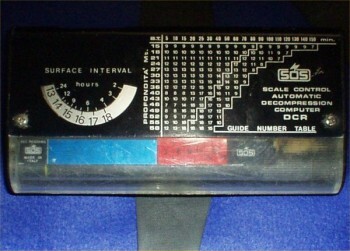 The DCR is for personal use like all decompression metres having built-in memory; thus it cannot be used by another diver until 6 hours have elapsed since the previous dive. The DCR has the same type of measuring instrument of the DCS decompression metre which is known for its robustness and reliability. The DCR is flat and rectangular with round edges, size 14.7 x 7.5 x 2.8. It has an anodized aluminium casing. Its air weight is 225 gr (0,5 oz)."